Thanks to a highly encouraging monsoon leading to a bumper food grains harvest, India finally got relief from a searing inflation in prices of food items. Not only that, the record food grains production of 263.20mt (million tonnes) in 2013/14 is to leave enough surplus of rice and wheat for exports. India harvests food crops in two phases — summer-monsoon kharif (July to December) yielding rice, sugarcane and oilseeds like soybean, groundnut and rapeseed and winter rabi (November to March) when, besides wheat and rice, some other oilseeds are grown. The fate of kharif crops is linked to the behaviour of southwest monsoon between June and September. It also has a significant bearing on winter crops, which draws sustenance from soil moisture and water levels in reservoirs left by southwest monsoon. Fortunately for the country, the 2013 monsoon was recorded as having the fastest pace of advancement from the breakout point in Kerala to the rest of the country since 1941, and the season finally ended with 106% of the long period average rain. No wonder, India, the world’s second largest rice producer after China, is set to harvest a record crop of 106.20mt (second advance estimate), including 96mt in the summer monsoon period and the expected winter rice production of 14.2mt. 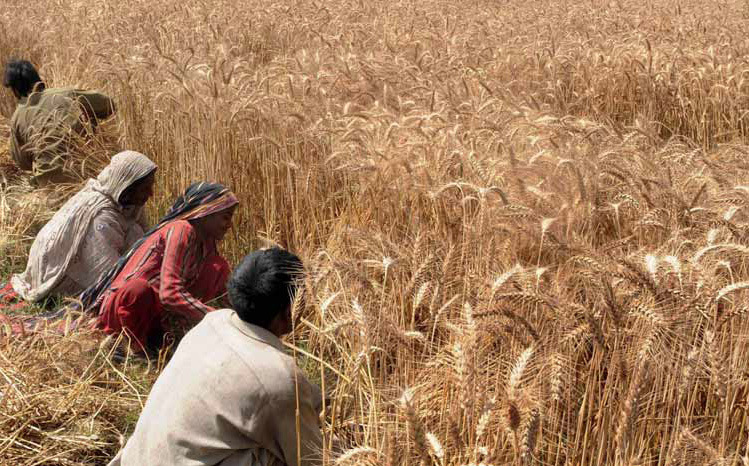 Unfortunately, unseasonal rains and hailstorms in the country’s principal wheat-growing states like Madhya Pradesh, Uttar Pradesh, Punjab and Haryana have somewhat clouded the yield prospect of wheat. Experts will not as yet hazard a guess about the likely wheat crop loss even though reports of logging, that is, crop falling flat are pouring in from some centres. Whatever the loss, some of that will be compensated by the rise in land under wheat to 31 million hectares in the current season from 29.6 million hectares in 2012/13, plentiful supply of improved varieties of seeds and absence of yellow rust. Imports of edible oils in a major way and pulses to some extent are among the commodities responsible for the current unacceptably high current account deficit (CAD) faced by the country. Among the slew of steps that the government has taken to address CAD problem are stepping up the productivity of oilseeds through technology missions designed to motivate farmers to use high yielding and hybrid seeds and cast a safety net to protect crops from damages by insects, pests and weeds, a major problem area for the Indian farm sector in general. An industry official says even while “our oilseeds production this year is likely to see an improvement over the record production of 32.5mt in 2010/11, our oils imports this time will be a record 11.2mt compared with 10.679mt last season.” No doubt, over the past decade, oilseeds productivity has improved from around 810kg a hectare to about 1,500kg a hectare. But this is still just about half the average world productivity. India has a growing middle class with high disposable income, allowing them to consume food, the preparation of which requires use of good quantities of edible oils. Imports are rising because of this and also due to population growth. Farm sector expert Om Prakash Dhanuka says,“getting more land under oilseeds or any other crops is to become more and more difficult. Yes, farmers will move from one crop to another for a growing season or more depending on relative rates of return. To give one example, enticed by high returns farmers grew sugarcane in 5.064 million hectares in 2012/13 compared with 4.316 million hectares in 2000/01. The reality, however, is India has recorded a 2% decline in agricultural land area in the past two decades, while factor annual productivity growth is only 2%.” The challenge for the country is to harness technologies that will allow food production of 500mt by 2040 when its population is to increase to 1.5 billion from the present 1.2 billion. According to Dhanuka, technologies will have to be such as to respond to the compulsion of producing larger crops with less and less water. Moreover, the seeds will have to be such as to lend resilience to crops to withstand the impact of climate change. Thankfully things are changing in India. For example, no sooner had the weatherman sounded the alarm of the likely emergence of the El Niño phenomenon leading to a poor monsoon in India this year, than the agriculture ministry gave guidance to the states to prepare contingency plans. Well ahead of the monsoon starting in June, the states will have to be ready with rainfall and soil maps for each district and details of response to different levels of deficiency in rains. Contingency plans also require of the states to stock large quantities of seeds of short duration crops. The US Department of Agriculture says a poor or erratic monsoon that may be triggered by El Niño could bring down Indian rice production during 2014/15 season by anything between 10 and 12mt. In the meantime, however, India built highly comfortable food stocks of 53.19mt, including 32.35mt of rice and 20.84mt of wheat as of March 1, 2014. The Prime Minister’s Economic Advisory Council says in a paper that good rains are likely to lift production of pulses to over 20mt this year from 18.45mt in 2012/13. If the forecast comes true, then our annual import dependence will be down. Last year India had to import 3.84mt of pulses when domestic demand was close to 21mt. Pulses imports prove expensive since not many countries grow this crop. The agriculture ministry has forecast this year’s demand at 21.77mt. Dhanuka says of all the imports of agricultural products, procurement of oilseeds and pulses costs the maximum and that leaves a major impact on the country’s balance of payments. “Self-reliance in pulses is our target. But this is to be seen in the context of growing demand for lentil, green gram, chick pea and red kidney beans, which scientists and dieticians strongly recommend for vegetarians as the most important source of vitamin for them. Close to two-thirds of the Indian population are vegetarian, including part-time vegetarians. The rise in this year’s pulses production is largely on account of good rains. But for sustainable high production, technology breakthroughs supported by ideal packages of agricultural practices are needed.” Canada is reportedly interested in a tie-up with Indian government owned agriculture research agency ICRISAT for transfer of frontier technologies in pulses growing. India imports pulses from Myanmar, Canada and African countries. If the weather does not play truant in the next few weeks then India could record an encouraging agriculture growth rate of 4.8% this year against 1.9% in 2012/13. For the current five-year plan period (2012/17), the farm growth rate target is 4%. Bumper rice and wheat crops and overflowing warehouses in the country causing concern about wastage and disturbing political turmoil in Ukraine have created ideal condition for India to step up exports of both rice and wheat. India, which last year became the world’s largest exporter of rice leaving behind Thailand, is set to make record shipments of the cereal in 2013/14, according to the USDA. Besides regular rice, India is likely to make an improvement on export shipments of long- grain, fragrant basmati rice in 2013/14 over last year’s 3.46mt. The unique rice species basmati grown exclusively in India and Pakistan and which is available in the market as white and brown depending on the milling process is as popular in West Asia as in Europe and the US. The outlook for exports to the US should improve as the country has given indications of relaxing its import tolerance norms for fungicide found in basmati rice originating in India. The popularity of this special rice and readiness of buyers to pay a premium for basmati encouraged some combines of laboratories and investors in the US to develop clones of the original and then make attempts to pass those in the market as basmati rice. An Indian government official says “clones whatever the pretensions are never like original. We are making attempts to obtain legal protection to basmati rice brand under Geographical Indications tag.” But the Indian efforts in getting the tag is delayed due to various government departments failing to come to a common platform and Pakistani opposition to include any new Indian areas like Madhya Pradesh in Geographical Indication scope. World wheat prices got a leg up in the wake of Ukrainian crisis, which is further exacerbated by a Soviet style referendum letting Crimea to join Russia. This and also reports that farmers in Ukraine are hoarding the grain against the country’s depreciating currency created by political crisis are to incentivize exports by India. At a recent trade conference in Singapore, the consensus emerged that India’s wheat exports could climb to 5mt this year from 3mt in 2012/13 and a good portion of export sales could fetch $290 a tonne. Depending on the scale of stand-off between Russia and Ukraine and severity of Western sanctions, India would stand to cut into the share of the two countries in wheat sales to West Asia and south-east Asia. After many months of intense lobbying by the country’s bleeding sugar mill industry and growing restiveness among farmers for their long-pending bills for cane supplied to factories not being settled, New Delhi finally sanctioned export of 4mt of sugar in the next two years. As it would happen, India’s arrival in the world market coincides with reports of dry weather to crimp sugar output in the world’s biggest producer and exporter Brazil. Experts see sugar moving into bull market territory since prices of late is up nearly 20% from the recent low. Even then, the carefully drafted WTO complaint subsidy of Rs3,300 ($53) a tonne offered by New Delhi is making exports a feasible proposition. According to Abinash Verma, director general of Indian Sugar Mills Association, of the export contracts for 1.6mt made so far as much as 1.35mt have been despatched.The trade is in the process of wrapping up export contracts for another 400,000 tonnes. While Iran has become the major outlet for Indian raw sugar, deals have also been made with Bangladesh and some south-east Asian countries. “An inventory of close to 9mt at start of the current season in October 2013 and the prospect of a bumper sugar production fourth year in a row require of the government to promote exports and discourage imports through a high customs barrier,” says Dhanuka.